What’s more interesting though are the new processors that NVIDIA holds for the future. 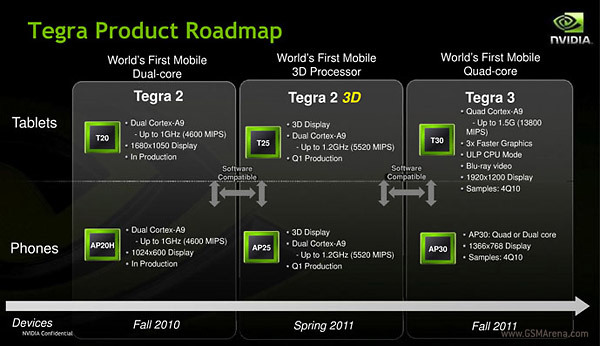 This leaked roadmap (that is supposed to be announced at the MWC 2011) shows the improved dual-core Tegra 2 3D and the quad-core animal – Tegra 3. The current generation of Tegra 2 chips uses a dual-core Cortex-A9 processor, clocked at up to 1Ghz. In 2011 those will be superseded by the Tegra 2 3D chips. Those will feature the same dual-core architecture, but clocked a little bit higher at 1.2 GHz and most importantly, will have support for 3D displays. That should put the company on terms with the latest TI OMAP4 platform, which supports 3D displays and 3D cameras just as well (but is not ready for market release). In fall this year we can also expect the Tegra 3, which, according to NVIDIA’s CEO Jen-Hsun Huang, is almost done. The quad-core Tegra 3 ticks at 1.5 Ghz and according to the roadmap has 3x the graphics performance of the Tegra 2 3D, support for Blu-ray video and video output up to 1920×1200 resolution. Let us know in the comments what’s your take on the NVIDIA’s strategy to take over the high-end mobile platform market. Do you think they’ll succeed?